As regular readers of RapReviews are aware I go off the hip-hop music and culture topic every now and then to discuss global issues, professional sports and controversial topics. It's not that I don't like to keep it hip-hop, but I'm already doing 3-4 album reviews a week anyway, and these editorials allow me to break things up and breathe a little bit. It's also a chance for me to expound on some things that are personal to me or that have significance in my life. I appreciate having that forum so I want to say thank you for taking the time to read what I have to say, whether it's serious or frivolous. Paragraph three and on will be the latter. I'd like to offset the largely trivial nature of what I'm about to discuss in the paragraphs below by pointing out that there are in fact real things on my mind now - like the massive earthquake in Nepal, civil unrest in Baltimore and Jon Jones being involved in a hit-and-run. A bad week in the news all around. In the grand scheme of things the availability of $10-$15 (average MSRP of $12.99) plastic toys is definitely not a pressing concern. It is however disconcerting when Nintendo legend Shigeru Miyamoto points out the obvious: "Nintendo is known as a video game company, but in fact, it is also a toy company." Historically that's accurate. The company went through several phases of novelty and entertainment items, starting first with playing cards (called hanafuda in Japan), until they eventually found their way to being a video game and consumer electronics kingpin in the 1980's. Miyamoto's Donkey Kong paved the way for a string of successes in the decades to follow, particularly with home consoles like the Nintendo Entertainment System (NES). The reason for the overwhelming success of the Amiibo toys for Nintendo is that they combine the best of both worlds - a collectible item that's also useful as an accessory in games like Mario Kart 8 and Super Smash Bros. - unlocking new items and new features unavailable without them. It also taps into a deep rooted feeling that for many of us dates back to childhood of wanting to see two-dimensional characters video game characters we loved brought to life in the third dimension. The toys are quite frankly awesome to look at and display even if you're not playing - and not just for major characters like Mega Man and Sonic the Hedgehog. Just take a look at the detail on King Dedede for example. The "problem" if you can call it such is that toy companies these days (which Nintendo is calling itself so we will too) have gotten in bed with the speculative side of toy collecting and contracted the venereal disease of scalpers. In Europe and Japan this is not a big problem - the toys there stay readily available even months after they are released - which is why I've had to resort to importing to get a few. In the United States and Canada, they've decided that creating artificial supply shortages is somehow "good buzz." If people are bitching about not being able to find short print run figures like Villager, Wii Fit Trainer and Little Mac, Nintendo assumes the raging debate about discontinuing or limiting quantities only helps make Amiibos more popular and increases the rate that $13 toys fly off the shelves. Rather than addressing the short supply of figures that are available to collectors, particularly those of us (like me unfortunately) who like to get a complete set, they've chosen to blame things like the West coast port strike for the lack of hard-to-find toys. They've also further exacerbated the shortfall by limiting certain figures for each Amiibo wave to only one retailer. It defies common sense. As a child you could go to any store selling toys to get the toy you wanted - KB Toys, Target, WalMart, Toys "R" Us, and so on. Now you have to hit a hodgepodge of stores for the "exclusives." Shulk is only available at GameStop, Lucario is only available at TRU, Rosalina is only available at Target, and so on. I can't say their strategy is wrong because the hype is real. Pre-orders sell out instantly when they go online. Long lines form outside any store with an exclusive the day it becomes available before they open. The reason people put up with the short online windows and long outdoor waits is because it's the only way to pay a reasonable price. On the secondary market like eBay these "rare" (a misused term but an easily understood one I'll borrow) fetch outrageous prices of $50-$100. That's why I say Nintendo is in bed with the scalpers. It's feeding the publicity machine when people are appalled by the short supply and high prices, going online to complain about it, and driving more people to the stores to "get them before it's too late" or some eBay scalper/hoarder gets them all to mark them up. The speculative nature of things will eventually be its own undoing when resellers acquire more stock than people want. It may take a year, two, five or even ten. Collectible markets do collapse and Amiibos will too. The real shame of it is that in the meantime Nintendo is openly profiting on making people angry and frustrated, and as one writer recently opined, the worm may be about to turn. 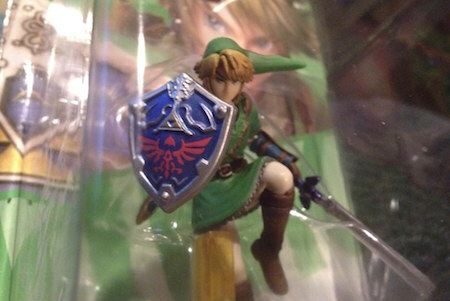 Nintendo may be enjoying record profits given that 100% of store exclusives sell out, driving sales of more commonly available figures like Link (pictured at the top), but is it worth making your most loyal customers bitter and vitriolic because short supply leads to high profits for scalpers? After all they are only made out of plastic and RFID chips, not platinum and rubies, SO JUST MAKE MORE AND MAKE THEM MORE AVAILABLE. It's especially ridiculous to have short supplies of figures like Marth when current and upcoming games have features that can be unlocked with his figure. Not only is Nintendo making it hard for collectors to enjoy the hunt, they are making it hard for gamers to play the games. At some point the madness has to stop.